Cain Ellsworth’s human resources director, Julie has extensive experience in human resources programs, services and functions including compliance issues, performance improvement, and employee development. Julie, who joined the firm in 2011, is excited about Human Resources and the important and ever changing role this function plays in all organizations. 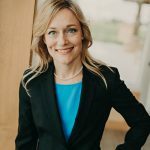 She is a member of various committees and organizations including the Society of Human Resources Management and the Northwest Iowa Chapter of the Employers Council of Iowa. Julie and her husband, Ben, have four children. Degree: BA Business Administration, National American University, 1998.